Award winners, Beth Carton and Abby Flynn with Waterford Camogie Chairperson, Ita Murphy at the WLR/Granville Hotel GAA Awards. Photo: Noel Browne. It was a great evening of celebration and entertainment in the Granville Hotel on Saturday last for the WLR/Granville Hotel GAA Awards overall dinner where De La Salle’s Beth Carton was the very popular winner of the premier award seeing off the ten other monthly nominees that included the St. Angelas Ursuline All Ireland Colleges double winning teams and the star of Waterford’s Munster Minor Camogie winning side Kate Lynch of Gaultier. Indeed, it was a great occasion for Waterford Camogie as Abby Flynn of St. Angelas collected the Kevin Casey Emerging Young Player award for her performances in helping her school to the All-Ireland double, captaining the Junior side and taking the ‘player of the match’ award in the final. The selection of Beth Carton as the winner of the prestigious annual award was no great surprise. Beth has won rave reviews all year for her performances with Waterford amassing an amazing 3-36 in five championship games throughout the summer in which the victories over Limerick and Clare were the highlights. 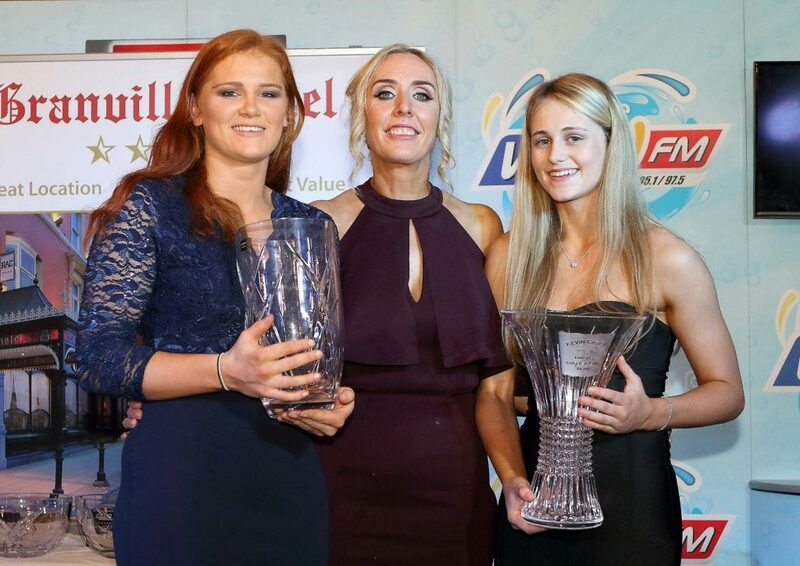 It was her performances in those games that particularly caught the eye of All-Star selectors as she went on to become Waterford camogie’s first ever All-Star winner in November last. Beth is the second camogie player to win this award following in the steps of Gaultier star Trish Jackman who took it a few years ago. In accepting the award Beth paid tribute to her predecessor who, she said, was a trailblazer and a great example to her and the players coming through from underage at the time. It was a proud evening for Beth’s parents, Munster GAA Games Manager Joey Carton and his wife Marissa while the winning of the award will also be a source of great pride to her grandfather, former Waterford F.C. star defender during the heyday of Waterford soccer, Tony Dunphy of Lismore Lawn. With St. Angelas having won the Munster ‘A’ senior camogie title with a great win over Scoil na Trinoide Naofa in Cappamore earlier that afternoon there was a great atmosphere and the March award winners were in real celebratory mood as star player Abbey Flynn collected the Kevin Casey award from Kevin’s wife Marguerite. Abbey hit five points in her sides 1-11 to 0-5 win that afternoon with the remaining scores coming from Annie Fitzgerald, another star of St. Angelas double winning side last year. Overall it was a great evening for Ladies GAA with Abbeyside footballer Eimer Fennell taking the April award for her display in scoring three goals in Waterford’s National League win over Laois. The selection of ten time All Ireland hurling winner Henry Shefflin as guest of honour was a master stroke as the RTE pundit’ settled easily into the slot taking part in the interviewing of the monthly awards winners with Gavin Whelan, showing great interest and knowledge where all were concerned and making the occasion hugely entertaining. There was some great banter when it came to interviewing Ballygunner stars Philip and Pauric Mahony in view of the upcoming All Ireland semi-final between Shefflin’s Ballyhale side and Ballygunner which takes place in Thurles on Sunday fortnight next. There is clearly great respect on both sides going into this game with it all coming down to which team is best on the day.